Cynthia Lazaroff is a documentary filmmaker who has spent the past year interviewing officials and experts in the United States and Russia on nuclear dangers. She has founded groundbreaking US-Russian exchange initiatives since the early 1980s. Cynthia lives with Bruce Allyn and their family on a farm on Kaua’I, Hawaii. She and Bruce are engaged in Track II diplomacy with Russia and worked together on a series of dialogues on the 1962 Cuban Missile Crisis. In December 2017 Cynthia and Bruce met with Mikhail Gorbachev. They talked about the need to abolish and ban nuclear weapons. In this article, she recounts the experience that followed her return to Hawaii. Bruce is about to leave for the farmer’s market when his nephew, Tom, bursts in, trying to catch his breath. He shoves his cell phone in front of Bruce, who reads the text message. “I don’t believe this,” Bruce says. I immediately think of Julie, Tom’s mom. Is she having complications with her surgery? Is she still with us? “What is it?” I ask. Tom is still catching his breath. He’s run a thousand yards from the beach. I check my phone, which I switched to silent overnight. There it is. Bruce looks again at his phone. At this very moment the alert appears on his screen. We have different carriers. AT&T subscribers are receiving the alert after Verizon’s. It is January 2018, at the height of “fire and fury” fears about North Korean nuclear tests and long-range missiles; I know more than I want to know about nuclear weapons. Bruce and I have spent decades of our lives working on US-Russian relations—he in Russia-related faculty positions at Harvard, I as a filmmaker and founder of US-Russian exchange initiatives—and much of the past year interviewing top officials and experts in Washington and Moscow about the escalating nuclear danger. We face a complex set of nuclear threats that could lead to a 21st century Armageddon in any number of ways—through bluster, blunder, accident, miscalculation, malfunctioning sensors, malware, terrorist computer hacking, or simple human rage and reaction. Now, though, that threat is no longer theoretical; it is here, “INBOUND TO HAWAII,” on its way to us, to our home on one of the most remote island chains in the world. Can this really be happening to us? I know all the nuclear nightmare scenarios, and why this could be real. Yet right now I am frozen, caught as if clueless. “I’m calling Felicia,” I say. Felicia Cowden hosts Kaua’i Soapbox, the most popular radio show here on the island, knows everybody, and is the first to know anything. But she isn’t picking up her cell phone. I text her and check her Facebook page, where one of her friends has posted the alert asking whether anyone else has received it. Bruce dials and redials 911, gets a constant busy signal. “Everybody is calling 911 right now,” he says. “I don’t think this is real but I’m going to pick up the girls.” Our two younger daughters are in Kapa’a, about seven miles away. “Call me in the car,” he says, already out the door. Everything that should be obvious for someone with my background and expertise eludes me. The thought never crosses my mind that we might have just a few minutes before we are hit, that Bruce might not be able to get to Kapa’a and back quickly … that I might never see him or the girls again. I don’t think about what I should absolutely know, what Bruce discovers when he pulls out on the highway: There are already terrified people driving 90-to-100 miles an hour, racing to find shelter or to spend their last few minutes with loved ones. There will be traffic accidents within minutes. The world has entered an unimaginably deadly new arms race, with no rules of the road and no scheduled arms control talks for these new weapons systems. In three years, New START, the US-Russia agreement that limits nuclear arsenals, is set to lapse, removing the last agreed restraint on arsenal sizes. President Trump has said that he wants the US nuclear arsenal to return to the “top of the pack.” His administration’s new Nuclear Posture Review calls for expanding the use of nuclear weapons—specifically new, “low-yield” nuclear weapons. The United States is now planning to use little nukes in response to an array of non-nuclear attacks—say, cyberattacks on our infrastructure. This frightening policy is disguised with the seemingly innocuous label “tailored deterrence,” as if the Defense Department had just ordered a new suit of nuclear clothes. The Pentagon argues that this policy is needed to counter advances made under the Russian nuclear modernization program. The Russians argue they were forced to start developing new weapons systems when the US expanded NATO eastward after the Soviet Union collapsed, and the George W. Bush administration then unilaterally withdrew in 2002 from the cornerstone Anti-Ballistic Missile Treaty, which largely prohibited systems that could shoot down the other side’s nuclear missiles. NATO countries and missile defense installations on the Russian doorstep, President Vladimir Putin says, undermined deterrence—the concept of Mutual Assured Destruction, or MAD—in which both sides knew that to strike first with nuclear weapons would certainly spark a massive counterattack that would leave both countries in ruins. Until 2002, the world could “rely” on MAD to keep the peace. Now, Putin argues, the world is in a post-MAD universe that Trump has only made more dangerous, calling for the creation of a “Space Force” with “a new space kill layer” to shoot down waves of enemy warheads, and thereby conjuring up an image of swarms of fighters and lasers from Star Wars. An arms race in emerging technologies is also advancing rapidly—research programs on military applications of artificial intelligence, directed energy, advanced robotics, biotechnology, and nanotechnology are well under way in countries around the world. We’re not yet at The Terminator scenario with Skynet, the artificial general intelligence system that gained self-awareness after it spread into millions of computer servers around the world. But in five to 10 years, experts tell us, we will likely have AI decision-support tools in nuclear decision-making. What if, in a moment of crisis, the AI says to a future president: “I have run one million simulations. The best way for you to come out of this, even though it will be very high cost, is to strike now with nuclear weapons.” We will have sentient computers, like HAL in 2001: A Space Odyssey, ready to make existential determinations for us. One of the weapons Putin described in his speech was a nuclear powered cruise missile that sneaks around the tip of South America and zeroes in … on Hawaii. It is not an alarmist exaggeration to state it baldly: We are in a new, unchecked arms race with Russia, built on terrifying new technologies, new lethal weapons of mass destruction in what veteran Russia analyst Robert Legvold called in our interview with him, “a multipolar nuclear world that is slowly spinning out of control.” To add to the danger, our command and control is not invulnerable to a terrorist cyberattack. While experts say such a cyber hack is a very low probability, if a hack were successful, the consequences could be apocalyptic. And the hacking threat is compounded by the danger that insiders might assist terrorist groups or engage in sabotage. A Russian colleague told us last year that ISIS has been trying to recruit Russian hackers, and some have gone missing. And don’t forget the thousands of “old” nuclear weapons the United States and Russia have aimed at each other, with an estimated 800 ICBMs, loaded with 1,500 warheads, right now on hair trigger alert. These weapons are governed by a “Launch on Warning” policy, under which the US or Russian President could launch nuclear ICBMs upon detection of incoming missiles—even though the warning could be false. (And we have had over a thousand false alarms in past decades.) The president has just minutes to decide. And the missiles cannot be called back. Now which one of these nuclear nightmare scenarios is on its way to us this morning? I phone our close friends Prajna and Greg. They don’t know anything. They haven’t yet checked their cell phones. It takes a moment for it all to sink in. “How long ago did Tom get the message?” Greg asks. Tom checks his cell phone. “About seven or eight minutes ago,” he answers. We are all calculating — maybe 20 or 15 or how many minutes left until … flash, blast wave, death. Where might it hit? I know that North Korea put out a photo with targets showing Honolulu and Pearl Harbor, the headquarters of the US Pacific Fleet. But Kaua’i also has a very big target—the Pacific Missile Range Facility, the world’s largest missile test facility. It is just 20 miles as the crow flies from our home. Last summer the facility was used to test a new defensive missile—the SM-3 Block IIA––designed to intercept North Korean missiles. The test failed. One Pentagon official described the problem in a way that has been used so often as to become a cliché: The challenge is like trying “to hit a bullet with another bullet.” Pyongyang regularly practices “firing salvos of missiles because the American system is designed to intercept only one or two incoming warheads at a time.” Since 1999, the United States has spent 0 billion on missile defense and the core system has failed 8 of 18 tests. If this is just one incoming missile from North Korea our chances of stopping it are no better than 50-50. “What about the meditation cave near you?” Greg asks. “That’s it!” I answer. Though I discussed this very plan with Felicia last summer, I haven’t thought of shelter, or where to meet Bruce and the girls, until this second. “We’re on our way,” Greg says. “How much water do I have time to collect?” I ask myself. I know more about these kinds of preparations than most people in the world, but I am completely unprepared to carry them out. I feel a pang of regret over ridiculing and mocking the guidelines that, after Kim Jong-un’s threats, the state of Hawaii posted on how to survive a nuclear attack. But how do you prepare for a nuclear war? When I lived in California, I kept an earthquake kit in my house, one in my car and one in my garage, along with two 25-gallon barrels of water, regularly replenished after the expiration date. But before I actually prepare for a nuclear war, I have to admit to myself that the unimaginable could happen, that the unimaginable could be real. I have used my expertise as an excuse to tell myself that we cannot prepare because I don’t want to prepare to live in that world. Now I am in it. I look at my cell phone and see a voicemail from Felicia. I try to listen to her message but it won’t play. I phone her back, and she says, “The county officials say to take shelter.” That’s not what I want to hear. County officials run the island. If they’re telling us to take shelter, this is real. We could be hit. In minutes. To be prepared for a nuclear attack, the Hawaii Emergency Management Agency recommends, families should stockpile a minimum of one gallon of water a day per person for two weeks. I haven’t stored any water, or any of the two weeks of canned food per person HEMA recommends. I have done nothing to prepare my family for this. I grab the only two bottles of water I have and all the fruit on the counter—a bunch of bananas and four lilikoi. I look at my phone. It has only a 12 percent charge. I recall that our neighbor put electric lights in the meditation cave. Maybe there’s an outlet in there. I grab my phone charger, my computer, my computer charger, my purse, my passport. Will I really have any use for any of these things? I know how ludicrous it is to consider the prospects for surviving a full-scale nuclear war between the United States and Russia, the two largest nuclear powers. Who would want to survive, on an Earth radiated and cloaked in nuclear winter? It would be an extinction event, like the asteroid impact that wiped out the dinosaurs—except it would come from us, not space. I well know that even a single ballistic missile could cause events to spiral out of control. A limited nuclear exchange between the United States and North Korea (or India and Pakistan, or some other combination of the nine nuclear weapons countries) could rapidly escalate into a widespread nuclear conflagration, as allies respond to an initial attack. Right this very minute, Kim Jong-un could be sitting with his generals, and one of them could be arguing that Trump has put out a false missile threat in Hawaii so that he can use it as a pretext to destroy North Korean missile facilities, getting rid of Kim Jong-un along the way, like Gaddafi and Saddam Hussein. So, the generals say, we better launch all we’ve got right now. And what if Kim Jong-un had a bad night’s sleep? It’s hard to fathom that the world was safer during the Cold War, when the United States and the Soviet Union threatened each other with 60,000 nuclear weapons. But perhaps it was. Back then there were only two leaders with nuclear suitcases, who, it was presumed, under conditions of mutually assured destruction, would be rational. Neither leader would intentionally launch first, neither leader would intentionally commit nuclear suicide. Now there are nine nuclear powers, not just one or two Dr. Strangeloves, and an unpredictable, inexperienced tantrum-tweeter occupies the Oval Office. I was sitting in Moscow a few weeks ago with Soviet leader Mikhail Gorbachev, the man who, with Ronald Reagan, did so much to end the Cold War. At 86, he still champions the dream of a world without nuclear weapons. President Trump, who has never known war, has called for a “tenfold increase in our nuclear arsenal.” Gorbachev, who lived through WWII—who came to see, as President Reagan did, the absolute horror of nuclear war—is urging the United States and Russia to reopen a dialogue, to hold a “full-scale summit on the entire range of issues,” to reengage in negotiations on further cuts in nuclear weapons. I have a Ballistic Missile Threat alert message on my cell phone. Did Trump or Kim Jong-un just lose it? 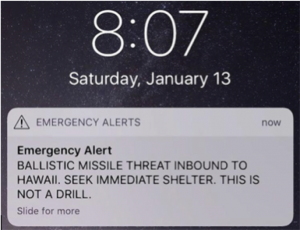 If the missile alert is real, I think, if it’s one incoming ballistic missile from North Korea, if it doesn’t hit Kaua’i—if it’s only one fission warhead that hits Pearl Harbor, 108 miles away, and if we can protect ourselves from radiation exposure, stay sealed in a shelter, then maybe we can survive. And we have since built thermonuclear devices that are 1,000 times the hellfire of the fission bombs dropped on Hiroshima and Nagasaki. The magnitude of nuclear danger today is genuinely staggering. Former Defense Secretary William Perry knows the nuclear danger as well as anyone alive today – and he has been telling everyone that he is terrified. I had started to wake up to the threat. Now here it is right in front of me—in capital letters on my cell phone, in my house. Is it our failure to cooperate with Russia on nuclear risk reduction that is bringing this missile to me this morning? God, I hope not. Better North Korea than Russia. Tom comes in wearing shorts and says he’s ready. I think again of the radiation that will come in a blast and tell him to put on some protective clothing. I start thinking about what I should wear. I grab leggings, socks and a big cotton shawl which I can use to wrap around my face. I look at Moussya, the wild cat we adopted, curled up on our bed. I want to take her with me but I know she will freak if I try. I have to leave her behind. On my way out the door, I turn to set the house alarm. The absurdity immediately strikes me: In a ballistic missile alert, I am thinking of setting the burglar alarm. It’s about a seven-minute walk to the cave. We have no time. “Let’s drive.” I say to Tom. As we pull away, I look back at our farm, at the houses of my neighbors. I think of them all inside, wondering if they know, and have the impulse of trying to phone them all at once. “I’ll call them from the cave,” I think, hoping my cell will have service inside. Will I ever hear her voice again? Will she survive if I don’t? Is whatever this is, whatever is happening here today the start of something that will erupt and consume all of civilization or will it just be one fission bomb that destroys Honolulu, with the inevitable retaliatory obliteration of North Korea, and mass carnage in Seoul? I climb as fast as I can up the steps to the cave. If we survive, will we risk leaving the cave for food and water? Will our cars still work? Will we walk the two miles to Whalers, our tiny village store? What will be the level of radioactive exposure? There won’t be any food left anyway. Ninety percent of our food is imported, arriving each week on boats. And if the boats stop coming, we have only a 10-day supply for the island. How long before the first responders arrive? Will the military in Hazmat suits find us here in the cave? Maybe we can still return to a normal life somewhere far away. Our home, our farm, the Hawaiian islands will be poisoned, radioactive. How will it affect the coral reefs? Tom and I reach the cave and the door opens. Our neighbors, Colleen and Paul, walk out smiling, water bottles in hand. “It was a false alarm,” Colleen says. “Jim just called. He got through to 911, and they said it was a mistake.” We stop. I linger on the steps for a moment and close my eyes. I hear the ocean. I feel the warmth of the wind across my cheek. The adrenaline lock on my body releases its grip, dissolves. I didn’t realize it was there until it let go. Everything, as I walk back onto our farm, looks more alive. The colors are all more vibrant. I find Moussya still curled up in her spot on the bed. I go online and take in the unfolding headlines, the images all over Hawaii, scenes of people running through the streets of Honolulu in panic, terror, confusion. I read about the father who had children in two different places and had to choose which child to spend the last minutes of his life with. The story that haunts me and will not go away is about desperate mothers and fathers in Honolulu breaking open storm drains, shoving their crying children down inside. It was an apocalypse that didn’t happen. An Armageddon that did not begin. It is for me again a sunrise. I am still here. I know what is at stake. But I watch people in the news looking back, not forward. The stories are mostly about outrage over the mistake that was made, blaming the guy who pushed the wrong button that sent the false warning, and what measures we can take to make sure this doesn’t ever happen again. But if this is the takeaway, we are still sleepwalking, thinking that we can make nuclear weapons fail-safe if we just add more redundancy, like adding a second person to check the alert button. No matter what we do, we will never be able to achieve infallibility. Machines break down. People make mistakes – in interpretation and judgment. Our luck held, this time. Still, I think a nuclear catastrophe is just a matter of time if we don’t act. I want the rest of the country to pay attention to what Hawaii has just experienced. This threat of nuclear attack is not a scenario, not a video game. Here this morning we experienced it personally, felt the terror. Now it is in my gut. I want our leaders to experience that same visceral awareness of how our lives – our lives – are at stake. Those 38 minutes made the unimaginable tangible, real. Even with everything I know and have learned, the unimaginable was still unimaginable. Until those 38 minutes. I think of my friends here on Kaua’i who seem completely unfazed by what happened this morning and those who are still so traumatized they are having a very hard time coping. None of us can find a satisfying way to explain to our children why we still have nuclear weapons, much less allay their fears. Here in Hawaii we have had a 38-minute preview of the future, a future that might but must not be. We still have time. We can look out our window: no procession of radioactive ghosts, no children whose future has been vaporized. The Day After reached more than 100 million Americans who shared a collective experience, in a universe far away from today’s siloed, individualized streaming experiences. When the film aired nationally on ABC, Americans gathered with families and friends at the same time on the same night, around the televisions in our living rooms. It was devastating to watch. After the first missile detonations, ABC ran no commercials. The network had trauma counselors ready for viewers to call in on a free 800 number. Back in the 1980s, Ted Koppel and many of his fellow journalists—along with film and television producers, writers and directors—came forward and helped turn the tide at a critical moment. They fulfilled their ethical responsibility to inform the public about the clear and present existential nuclear danger and played a role in bringing an end to the Cold War. Where are the Ted Koppels today? Can the journalist community step back from the hypnotic, millisecond-long news cycle to awaken us to the escalating nuclear danger that could blow everything and everyone we know out of our minds in an instant? Is there anyone in Hollywood up to taking on the nuclear reality of 2018? The Day After served as President Reagan’s nuclear wake-up call. But, by the time he watched it, Reagan had already had countless wake-up calls. Millions of Americans— physicians, religious leaders, celebrities, filmmakers, rock stars, artists, athletes and ordinary men women and children—rose up to challenge his nuclear arms build-up. They joined Business Executives for National Security, Physicians and Educators for Social Responsibility, Clergy and Laity Concerned, Women’s Action for Nuclear Disarmament, SANE, the Nuclear Freeze Movement, and countless other efforts that transcended religious, racial, ethnic, gender, socio-economic and partisan divides. They became citizen diplomats, got on planes to the Soviet Union to meet the “enemy” and joined forces with their Soviet counterparts to support Gorbachev’s rise to power and reduce the threat of nuclear war. They unified into what mediation expert William Ury calls the “Third Side,” a coalition that acts to serve the interests of the larger community. In the 1980s, people joined with politicians to ensure that The Day After that might be would never be. My prayer is that we all receive the wake-up call, the gift that I received during those 38 minutes in Hawaii. We are fiddling—consumed with everything but the end of life as we know it—while Rome burns. We may not be given another chance to wake up. Trump has gone to Helsinki to talk with Putin, but, unlike presidents Kennedy and Reagan, he fails to stand strong on issues where we disagree with Russia, therefore undermining the credibility of the arms control effort. He denies the seriousness of the Russian effort to subvert the 2016 US presidential election, and so other American leaders will not take his initiative to talk with Russia seriously. As a member of the human race, as a mother, I embrace the vision—of Reagan, Gorbachev, and ICAN—of a world without nuclear weapons. But making the world safe from nuclear weapons is a problem from hell. We cannot uninvent the knowledge of how to make them. If we abolish nuclear weapons, many warn, a rogue state or terrorist group could create its own nukes and take the world hostage. There are no easy ways out of the nuclear mess we are in. But many experts—including the “Four Horsemen of the Nuclear Apocalypse,” former Defense Secretary Perry, former US Sen. Sam Nunn, and former Secretaries of State Henry Kissinger and George Schultz—offer steps we can take right now to reduce the nuclear risk so humanity can survive our planet’s most dangerous time. Agree to take nuclear missiles off hair-trigger alert. If the United States and Russia begin to take their nuclear warheads off launch on warning, this will immediately reduce the time crunch—the impetus toward use of nuclear weapons—in moments of crisis. Maintain a dialogue on nuclear cooperation. We had one round of Strategic Stability Talks with the Russians last September. It’s time to schedule the next. We must at all times keep open channels of communication on nuclear risk reduction, a safe space insulated from our political differences, as we did during the old Cold War. Reopen military-to-military channels of communication with nuclear powers. We have managed to talk with the Russians and avoid major incidents in Syria, even though we are on opposite sides. There is no reason both countries can’t do the same for strategic, global conflict. Resume cooperation with Russia on preventing nuclear terrorism. A nuclear terrorist attack in New York, Moscow, or any of our large cities would not only result in hundreds of thousands of lives lost but would also have profound effects on world security and economics. Efforts should include cooperation to reduce the danger of cyber interference in strategic systems and command and control. Resurrect arms control negotiations. The United States has high confidence that the Russians are violating the Intermediate-range Nuclear Forces Treaty. The Russians are still angry over the US pullout from the Anti-Ballistic Missile Treaty. But Reagan and Gorbachev reached agreement in the 1980s when the divisions were at least as deep. Cooperate with Russia and other nuclear powers on nonproliferation. Reaffirm the declaration — made by both Reagan and Gorbachev — that a nuclear war cannot be won and must never be fought. The Trump nuclear posture takes us toward more “tailored” flexible use of nuclear weapons. The Russians have for some time threatened to use small nukes in Europe in an “escalate to de-escalate” strategy. To move to a more secure world, we need to change direction. Agree on rules of the road for cyberweapons and other emerging technologies. Adopt a no-first-use policy for nuclear weapons. Critics in the United States argue that this policy will reduce the security of our allies. But a no-first use pledge would demonstrate that the United States views its weapons as deterrents to nuclear warfare, not as tools of aggression. Take a bold step. Bill Perry and others, including General James Cartwright, former head of US Strategic Command, argue that the United States should do away with its land-based intercontinental ballistic missiles. They are the weapon system most likely to be fired in response to a false alarm and cause an apocalyptic, accidental nuclear war. And they are no longer needed to deter a nuclear strike from Russia, which can be achieved by the two other elements of the nuclear triad—submarines and bombers. Above all, we the people must act to compel our politicians to adopt this playbook, and then to act. Our lives are at stake. We cannot leave the decision to our leaders. We need journalists to fulfill their ethical responsibility to inform us about the escalating nuclear danger. We need Hollywood to step up to the plate and make a Day After for 2018. We need a mass global movement of people of all ages and walks of life. It was the kind of wake-up call that moved President Kennedy after the Cuban Missile Crisis to reach out to the Soviet Union. It was the kind of wake-up call that shifted the thinking of both Reagan and Gorbachev. And it’s the kind of wake-up call that this story of those 38 minutes, I hope, can help give to those who were not in Hawaii on January 13. For me and hundreds of thousands of others in Hawaii, that morning was a deeply personal near-death experience. The fear led us to reach out. We all called those dearest to say, “I love you.” The experience of feeling that you are about to be hit by a nuclear missile makes it absolutely clear what is most precious. I had already had the intellectual awakening, about the details of nuclear weapons and the nuclear threat, from all the top experts. But I didn’t know what it felt like in my gut—until I went through those 38 minutes. Even with everything I knew about nuclear war, and nuclear weapons, and Hiroshima, and fallout, and nuclear winter, nuclear war was unimaginable to me—until I went through these 38 minutes. And now the terror, and the risk, and the need to change our nuclear policy, the need to wake up, the need to realize that we’re in this danger and to do something about it—that mandate, that knowledge, that responsibility, as a mother, as a human being, is with me. And it will never leave me.